Absorbs 40 times its weight in body oils and suntan lotions. Also loves pollen! 300% more surface are than the “Ball” and can not get clogged in the water lines. Place SCUMBUG ™ in the pool skimmer (fit all) or free float in spa and flip over… when saturated, squeeze out, clean and reuse! Improves filtration and when placed in clean pool or spa, SCUMBUG helps to eliminate the formation of a scumline. Under normal conditions, SCUMBUG should last an average swimming session. This pool sponge offers a unique and easy way to clean and maintain your swimming pool. 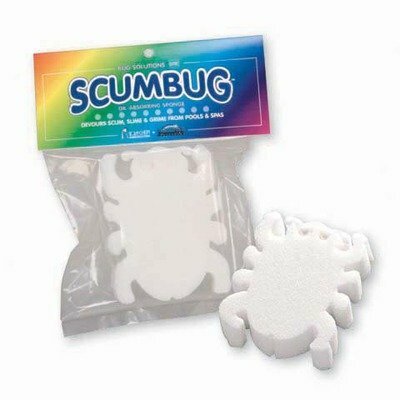 Simply place the Scumbug in any pool skimmer or free-float it in a spa, and the sponge will absorb 40 times its weight in pollen, body oils and suntan lotions. Once the Scumbug is dirty, squeeze it out, clean it and reuse it for a summer of clean swimming.